Armin J. Boehm, 94, town of Emmet, died Thursday, Jan. 24, 2019, after a lingering illness, at Cedar Creek Manor, Mosinee, under the Care of Aspirus Comfort Care and Hospice Services. He was born May 3, 1924, in the town of Emmet, the son of the late Thomas and Elizabeth (Baur) Boehm. He married Lorraine Stachura on Aug. 23, 1947, at St. Paul Catholic Church, Mosinee. She survives. Armin had worked in various jobs including building electric motors at Marathon Electric also the Building Trades. He was seriously injured while working on the job. He then went to school where he received a degree in printing. He set up the Printing Department for Marathon County and managed that department until his retirement. 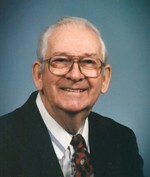 During his free time, he enjoyed hunting and fishing, and spending time with his children and grandchildren. He and his wife enjoyed traveling, visiting most of the 50 states and several foreign countries. Survivors, besides his wife of 71 years, Lorraine, include three daughters, Sandra Indahl, Beverly (Greg) Viertel and Barb (Dennis) Arel; three sons, Donald, Richard and Brian (Cindy) Boehm; nine grandchildren; three great-grandchildren; three sisters, Betty Drake, Dorothy Drake and Loretta (John) Kaiser; and four sisters-in-law, Gertrude Gerrow, Evelyn Romans, Carol Stachura and Pat Stachura. He was preceded in death by a son, Gary; newborn, Bruce; brothers and sisters-in-law, Roger and Marie Boehm, Loy and Dorothy Boehm, and Hubert (Mae) Boehm; brothers, Leon (Mary) Boehm and Thomas Boehm; brothers-in-law, James, Howard, Ray and Charles Stachura; brothers and sisters-in-law, Charles and Cecelia O’Neill, Henry and Berniece Sadowski, and Lorris and Marian Johnson; brother-in-law, Elmo Romans; and nephews, Jeffrey Drake, Lee Boehm and Fred Schreiber. In lieu of flowers, contributions in Armin’s name can be directed to St. Patrick’s Parish or Alzheimer and Parkinson’s foundations. To send flowers to the family of Armin J. Boehm, please visit our Heartfelt Sympathies Store.